And then I slid into a pretty serious depression. I don’t know how much I want to say about that here, except that it was both hormonal and historical — it grew out of the long grief I held about my own loss of motherhood, it grew out of shame I felt around my failures as a writer and facilitator and woman, it grew out of sorrow at how long it took for either my sister or I to become parents — all the work we had to do just to survive long enough for our soul’s to heal enough that we could imagine cradling another’s spirit with any determination or self-assurance, how unfair what our stepfather did was. It seems an understatement: unfair. Of course it is. And it’s true. And then, too, I was dealing with hormonal shifts, a depression that I fall into for about two weeks a month, every month. I cried and cried, every day, for two weeks. I fell deeper and deeper into this depression, so far in that I started to get scared — what was the point of anything, anyway? What difference would it really make if my nephew didn’t have this aunt? It’s not like he would remember me — and I didn’t have anything really to pass on to him anyway, did I? Wasn’t everyone showing me that — the fact that I couldn’t get anyone to sign up for my writing groups meant that I didn’t really have anything to share. (I offer these as examples of what’s going on for me when I’m thick in the throes of depression — not because I really believe that they’re true or because I need them to be negated here.) The scary voice in me that sounds like despair and loss and nihilism took over; I couldn’t self-talk my way out of its arguments, I wasn’t telling anyone what I was going through, and I wasn’t doing the sort of writing that will often help me notice and shift this sort of struggle. I didn’t see how it could ever be possible for me to live the sort of life I’d always imagined sharing with a child in some way: a life that looked an awful lot like the one I had as a very little girl living in the country in Nebraska (and that I tried to recreate in Maine) — a small life in a house with a big garden; bread rising in the kitchen; sprouts growing on the kitchen window; herbs drying from the rafters; pantry filled with jars of flours, seeds, nuts, spices; long walks through the garden and the surrounding fields or woods, talking about the plants that grew and what work they did in the earth, what work they did in our bodies; hours every day spent in physical labor; hours spent writing; hours spent walking and reading — I imagined being an adult who knew about the earth, about our environment, and getting to pass on that learning to the child/ren in my life. And then that all fell apart, and I came to the city, and I would never have a child anyway, so what difference would it make if I never learned the names or the gifts of the plants that grew in this new place I now inhabited? What difference would it make if I never lived that long-held dream? I thought about how I wouldn’t ever really be free from what I’d been through, how it would always be with me, and how I couldn’t protect this new child from all the evils this world has to offer. I knew that the depression was hormonal, but that knowing doesn’t really help — you can’t think your way out of depression, can you? In fact, knowing sometimes makes it worse; I’m thinking to myself, Jesus, pull it together, this is just hormones. And then, because I still feed bad, I become further depressed that I can’t talk my way, can’t rationalize my way, out of this feeling, can’t (at least, all alone) cognitively-behaviorize my way back to wellness. I put on as good a face as I could for those around me, even when I talked, finally, about how sad and low I was feeling. And when I began to bleed, and the depression abated, I felt relief — and I felt really scared. What if that low came back? I thought about folks who survive horrors, who live a long time with the aftermath, and then kill themselves after twenty or so years after, who looked like they made it, and then suddenly got taken down by history, or by the long and awful work of living in the aftermath of what they’d survived. I’m talking about this here for a reason: because so many of us struggle with depression, with these voices inside telling us that we’re worthless and that nothing will ever get better, and yet we feel profoundly isolated when we’re in the grip of this feeling. It seems like no one will understand us, no one will want to hear what we’re feeling, no one else has felt as bad as we are feeling. I want to undermine this experience of isolation. I want you to know you’re not alone in feeling these things, just as I’m reminded that I’m not alone whenever I talk to anyone else about depression. I didn’t bounce into buoyancy, as I often do when the hormones shift. I felt better, but I also felt subdued — I needed help. I didn’t want the depression to fall on me like that again. Because I can’t really afford to go to an herbalist or a physician right now, I went to the internet, and found some ideas for dietary changes and supplements that folks use to mitigate the intensity of PMS or PMDD, and I am trying those now. Suddenly, I’m one of those people with a handful of pills they swallow every morning (thanks to an amazon gift certificate I got for my birthday). Suddenly I am thinking again (link here) about how to prioritize my own wellness. Suddenly I am wondering what it would look like to really take care of myself first, to put my health and wellness at the top of my priority list. Suddenly I am looking at food differently — as something that can support not just my physical but also my mental wellness, or something that can cause me mental and psychic harm. The truth is, I don’t want to die. The truth is, I still have a lot of living and healing I want to do. The truth is, I am scared enough by how I felt last month — at a time when I should have been as happy as I have ever been in my whole life — to make some radical changes in my living. Why does it have to hit me so hard before I decide it’s acceptable to concentrate on my own wellness, that I deserve help as much as those around me do? This entry was posted in Uncategorized and tagged depression, familyluv, NPM14, SAAM, sister, trauma aftermath, trauma stewardship, WriOursWhoMo. Bookmark the permalink. 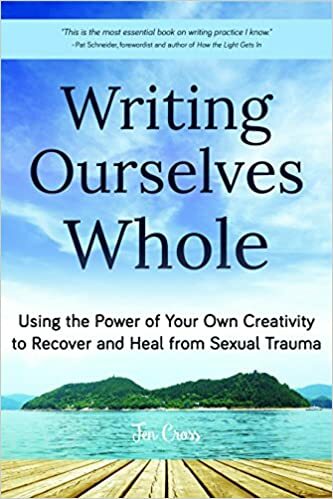 Writing Ourselves Whole: Using the power of your own creativity to recover and heal from sexual trauma (Mango Media). Available at amazon, barnes and noble, and indiebound. March 2019: Jen will be a writer-in-residence at the Kimmel Harding Nelson Center for the Arts in Nebraska City, NE. §Visit our schedule for the full listing of 2018 workshops and groups, as well as details about upcoming readings and special events! Audio: Jen in conversation with Amy Butcher, talking about writing as a practice for transforming trauma, on the amazing Pleasure Lab podcast (a Body Trust project), Season 2, #7, 11/12/17. Check out the latest Writing Ourselves Whole blog tour update for links to the amazing conversations I’ve been able to have with brilliant culture workers across the blog-o-sphere! The mission: We offer safe, confidential writing groups to a broad cross-section of the community, and in particular to those who are living in the aftermath of intimate violences. We engage a non-clinical, transformative and communal approach for those living with and in the aftermath of trauma, and recognize that resurrecting our own language and stories is a necessary part of re-ordering ourselves after trauma. The vision: Writing Ourselves Whole seeks to change the world through writing. We exist in the service of transforming struggle into art, turning isolation toward community, and creating spaces in which individuals may come to recognize the artist/writer within. What is Writing Ourselves Whole? What do you mean when you say 'transformative writing practice'? How can writing practice help trauma survivors?